For an undirected graph G = (V,E), we say that for ℓ,u,v ∈ V, ℓ separates u from v if the distance between u and ℓ differs from the distance from v to ℓ. A set of vertices L ⊆ V is a feasible solution if for every pair of vertices u,v ∈ V there is ℓ ∈ L that separates u from v. The metric dimension of a graph is the minimum cardinality of such a feasible solution. Here, we extend this well-studied problem to the case where each vertex v has a non-negative cost, and the goal is to find a feasible solution with a minimum total cost. This weighted version is NP-hard since the unweighted variant is known to be NP-hard. We show polynomial time algorithms for the cases where G is a path, a tree, a cycle, a cograph, a k-edge-augmented tree (that is, a tree with additional k edges) for a constant value of k, and a (not necessarily complete) wheel. The results for paths, trees, cycles, and complete wheels extend known polynomial time algorithms for the unweighted version, whereas the other results are the first known polynomial time algorithms for these classes of graphs even for the unweighted version. 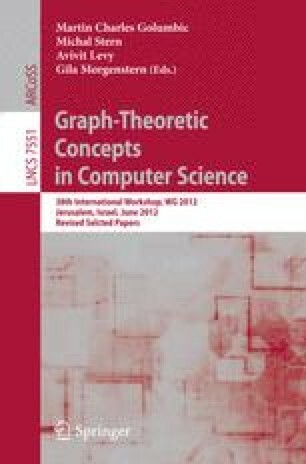 Next, we extend the set of graph classes for which computing the unweighted metric dimension of a graph is known to be NPC by showing that for split graphs, bipartite graphs, co-bipartite graphs, and line graphs of bipartite graphs, the problem of computing the unweighted metric dimension of the graph is NPC.